After a day of taking in all the sensations of Shanghai (including of course many fascinating culinary things) we set out bravely to present our particular version of ensemble vocal music to a mainland Chinese audience for the first time. 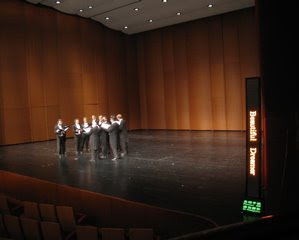 The Kings Singers have been here, but only in Shanghai and Beijing, and with a different kind of program than ours. 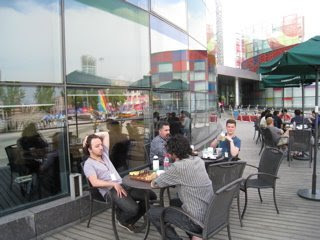 Our first performance was in Suzhou, now a business-industrial area housing many high-tech firms. The old part of Suzhou is the site of the most famous Chinese classical garden which, according to the schedule, we might have a few hours to see. What recently took 4 hours over a bumpy road alongside rice paddies, now takes 3 hours on this highway including an hour at a standstill. We arrived in Suzhou about an hour later than predicted. We arrive for lunch at the theater, then depart for the old part of Suzhou and our hotel - it having been determined that it would be better to stay in Suzhou rather than go back to Shanghai late at night. As it turned out there was a mixup at the hotel and we had no rooms. 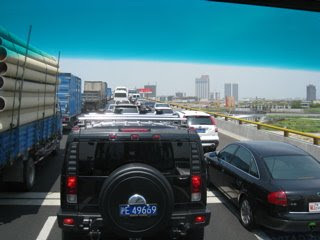 We decided that we would go on back to Shanghai after the concert after all. 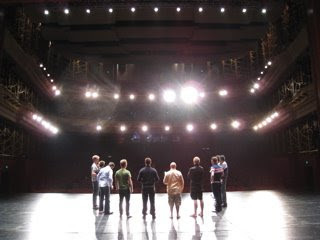 We turned around and went back to the theater to wait for rehearsal time. Having been within spitting distance of the tea house in the ancient Chinese garden, we now found ourselves at the Starbucks on the lake in back of the theater. The day was lovely, the lake was lovely, so for a few hours we joined the many people were out enjoying the national holiday. The Grand Theater, opened in 2007, houses a concert hall-opera house, an Imax and a dinner theater. The opera-concert stage is huge, with wing space the San Francisco Opera might envy. There are about 1200 seats, so as we rehearsed we wondered how many people would come to hear an unknown group of Americans practicing an art little known as yet in China. As we launched into the Stephen Foster songs with which we started the program, and looked out into the house, it felt a bit lonely - except of course for the guy with the video camera roaming around turning his lights on the audience .... People arrived in dribs and drabs during the first half, so that by intermission it was a good looking house! The Chinese invented super titles thousands of years ago - now they're electronic, and it's good to know that the audience knows what we're singing.